Rekha is responsive, stylish, clean and flexible template, ideal for Restaurants, Cafe, pizza Shop, Brasserie, Bar, Bakery etc. This template has a unique design and commercially reasonable which includes many beautiful elements that are very easy to edit. 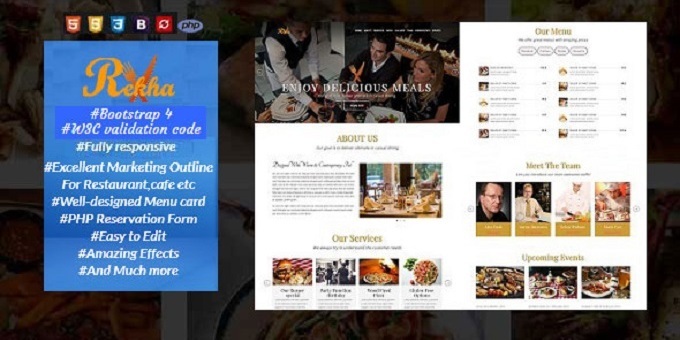 This template using many features which Impress your potential diners such as nice image sliders, Google fonts, Font Awesome icons, food menu card with four menu tabs, animated counter, testimonial, filtering pop-up gallery with four tabs, services, offer, events, about staffs, location with Google map and PHP fully working reservation form. This template has high quality, support and documentation that will help you easily to create your own website. Our template is adaptive, which allows it to be beautifully and correctly displayed on various mobile devices, as well as optimized for SEO purposes. All the code passes W3C validation and is compiled on the latest version of Bootstrap 4.The Reservation Form will allow users to enter specific dates using a date picker and they can also enter the time of their booking, and other additional details in optional message. Documentation file has been provided with file for the clear and detailed explanations about the whole item.